Mega PC-35 Lecithin – (Jarrow Formulas, 120 x 1200 mg; $9.75) Each softgel contains 1200 mg lecithin with choline 57 mg (from 35% PC lecithin) and 420 mg of phosphatidylcholine derived from soy. Phosphatidylcholine is a compound containing different types of fatty acids, glycerin, phosphorus and choline (a nitrogen-containing base). This may be an excellent product for people with hepatitis B or C, according to one well-designed study using 3 grams per day. Other benefits may be for mood enhancement for those with neurological disorders, to enhance cardiovascular health (in the context of a better diet), and possibly preventing or treating gallstones. For digestive health, NYBC is now carrying Twinlab’s Betaine HCL Caps (100 caps $9.50). Each capsule contains betaine (as betaine hydrochloride) – 648 mg plus pepsin, 130 mg. The addition of pepsin is thought to significantly improve the ability of the betaine to help the stomach lower the pH, that is, make the stomach more acid. That first amount of hydrochloric acid that your food hits arriving in the stomach is a crucial part of digestion. Betaine is typically used for people with a condition of low stomach acidity known as hypochlorhydria. This may actually be the problem even though one has reflux. It is a fairly common finding, for example, among people living with HIV, among a range of other conditions. Supplementing with betaine can help to improve digestion IF this is the case. Getting properly diagnosed before trying this is critically important. A 2013 study among healthy adults who had chemically-induced reduction in gastric acid (e.g., through proton-pump inhibitors) saw a reduction in stomach pH when given betaine supplements. Uridine-5-monophosphate, 60 capsules for $22.20 from Jarrow. Each capsule contains 250 mg Uridine-5’-monophosphate disodium salt. Uridine is one of the nucleotides that is used by the RNA molecule. It is found in abundance incorporated in the phospholipid membranes of neural (especially brain) tissue. Data are limited but suggestive of benefits for memory and liver function. This is not dissimilar to an intervention utilized to help minimize mitochondrial toxicity associated with some antiretroviral drugs. One study suggested this could reduce damage to AZT or d4t (stavudine or Zerit)-related mitochondria, however, markers of inflammation were worsened. So this one should probably be used in the context of an anti-inflammatory protocol such as including carnitine, NAC, alpha lipoic, curcumin, omega-3 fatty acids and the like, which are a good idea anyway to keep TNF, IL-6 and hsCRP in check. Astaxanthin 12 mg – 30 softgels $16.25 from Jarrow Formulas. Astaxanthin is one of the many varieties of carotenoids (beta-carotene being one of the longest known and best characterized). Studies are somewhat mixed on the benefits of this agent to offset oxidative stress induced by exercise, with some benefit seen among soccer players and none for cyclists. One study using a mix of carotenoids showed an enhancement of visual acuity. Other small studies suggest benefits for increasing HDL, skin tone, and reflux frequency. Garlic & Allicin Sadly, NYBC no longer carries Dr. Zhang’s popular Allicin supplement, however we have found these two excellent substitutes that indicate the amount of allicin and other components on the label. GarliPure from Natrol (120 “odor controlled” caps for $17). Each capsule contains 750 mcg of allicin along with 7.5 mg gamma glutamyl-cysteine, 5 mg allicin, 4 mg sulfur and 800 mcg of thiosulfinates, and GarliCell. Source Naturals’ GarliCell features “no after-odor.” Each $14 bottle has 90 tablets; each tablet contains 6 mg (6000 mcg) of allicin along with 4.2 mg sulfur and 6 mg of thiosulfinates. Allicin is thought to possess the greatest activity of garlic’s various components. Early studies showed some pretty robust effects on cryptosporidiosis. Aside from anti-infective activity, there may be some benefit for maintaining a healthy blood lipid profile. NYBC is now carrying a few new strengths and sizes of customer favorites. Our ever-popular “house brand” of CoQ10, Jarrow’s CoQ10 Q-Absorb, now is available in a very economical 120 x 100 mg softgel size for only $29. For those seeking a higher dose, we now also have CoQ10 400 mg (60 softgels) from Protocol for Life at $44.50. NYBC has also picked up Jarrow Formulas‘ new Curcumin Phytosome (each cap 500 mg curcumin phytosome-phosphatidylcholine complex with 18-22% curcuminoids), a formulation that may further improve the absorption of curcumin. In the Ayurvedic tradition, recipes often include honey or black pepper, today known to enhance the body’s ability to absorb this increasingly important and well-researched anti-inflammatory agent. A very moderately priced B100 (B Complex) from Twinlab for $11.75 that contains 100 mg of eachof the B-vitamins (and 100 mcg of B12). Each bottle, 100 capsules… Borage (Jarrow Formulas; 120 sg for $16.25) Provides one gram of polyunsaturated fatty acids from the Borago officinalis plant, including 240 mg of gamma linolenic acid (GLA/omega-3) and other fatty acids. This is a good source of GLA, especially in combination with flaxseed oil … New variation on SuperNutrition‘s Calcium Blend, an iron-free, easy-swallow formulation, same price ($14.25) and strength – just smaller (and more!) tablets. The humble garlic bulb has had quite a career: from ancient folk remedy; to established Chinese medicinal extract; to respect accorded to it by the most exacting modern research science. Allicin is the component of garlic that is believed to possess the greatest activity of medicinal interest. A presentation at the Interscience Conference on Antimicrobial Agents and Chemotherapy in December, 2002, for example, reported on the effectiveness of allicin in combating “superbugs”that become resistant to conventional antibiotics, such as vancomycin-resistant enterococci (VRE) and methicillin-resistant Staphylococcus aureus (MRSA). Aside from studies of its antibiotic power, allicin has recently been the subject of research substantiating its benefit to cardiovascular health. There has been a long but not entirely conclusive history of clinical studies examining the impact of garlic and allicin on conditions like high blood pressure and elevated cholesterol. However, a 2007 research report funded by the National Heart, Lung, and Blood Institute of the NIH and the American Heart Association significantly clarified the cardiovascular benefits of garlic. The investigators demonstrated precisely how garlic and its extract allicin stimulate production of a substance, hydrogen sulfide, that relaxes blood vessel cells, and thus supports health cardiovascular function. 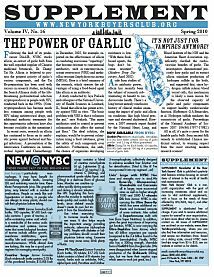 NYBC also stocks Garlicin Pro an enterically coated garlic supplement that eliminates aftertaste. I use natural treatments for most conditions, but I feel antibiotics are an integral part of successful treatment for Lyme disease. However, I do not believe antibiotics are enough for everyone. Some cases of Lyme disease require longer courses of antibiotics and supplemental treatments to facilitate the action of the antibiotic and reduce the effects the Borrelia and co-infections. Most people don’t know what group they fall into, so I feel that aggressive treatment is a good idea initially. Inappropriately short courses of antibiotics, or other treatments like steroids, often drive Lyme into defensive positions and cause chronic disease. Please contact NYBC at contact.nybc@newyorkbuyersclub.org for further information. A 2007 study funded by the National Heart, Lung, and Blood Institute(NIH) and the American Heart Association found that garlic and its extract allicin may benefit cardiovascular health by stimulating production of hydrogen sulfide in the body. Hydrogen sulfide is known to relax blood vessel cells and through this mechanism may be able to lower the risk of cardiovascular disease. This study thus helps account more precisely for the observed capacity of garlic and garlic components to support cardiovascular health. induces smooth muscle cell relaxation. In a series of studies, the vasoactivity of various garlic polysulfides was directly associated with their yields of hydrogen sulfide. These experiments provide a mechanism by which garlic works to lower cardiovascular risk. They also suggest that the potency of garlic supplements could be standardized based on their ability to produce hydrogen sulfide in relevant blood cells and tissues. Sciences (Proc Natl Acad Sci) 2007 104(46):17977-17982. Allicin is thought to possess the greatest activity of garlic’s various components, and a standard preparation has been used in some studies, including the Search Alliance study of cryptosporidiosis in people with HIV (see abstract below). Other reported uses of allicin range from bacterial infections to fungal infections. For information on obtaining allicin, please email contact.nybc@newyorkbuyersclub.org. The use of a high-dose garlic preparation for the treatment of Cryptosporidium parvum diarrhea. Fareed G, Scolaro M, Jordan W, Sanders N, Chesson C, Slattery M, Long D, Castro C.
Int Conf AIDS. 1996 Jul 7-12; 11: 288 (abstract no. Th.B.4215). AIDS Research Alliance, West Hollywood, CA, USA. Fax: 310-358-2431. A high-dose garlic concentrate (“Allicin,” 30mg) used in hospitals in China to treat refractory diarrhea was mixed and diluted in 90cc distilled water using a disposable container for administration twice daily in 20 patients with Cryptosporidium parvum positive in baseline stool samples and clinically significant diarrheal disease. Patients were instructed to take the first 30mg dose orally and to administer the second 30mg dose (if tolerated) by rectal retention enema. Eighteen patients were evaluable for at least 3 weeks of therapy. Fifteen of these had absolute CD4 counts less than 30 with two patients greater than 50 and one patient with 102 at baseline. Both a reduction in the number of bowel movements over the initial 3 weeks of treatment with a stabilization or mild increase in body weight was observed in 8 of these 18 patients. At six weeks, 10 of 16 evaluable patients continued to show a reduction in stool frequency and a further stabilization or increase in body weight. Among the 8 patients who have remained on the high-dose Allicin treatment for greater than 8 weeks, Cryptosporidium parvum stool exams have been repeatedly negative in 4 of the patients. The preparation was apparently well tolerated in a majority of patients. The major reported side effect was a strong garlic smell and taste, which contributed to one patient withdrawing from the study. Because of the lack of effective current therapies for Crypto-sporidium parvum diarrhea, the use of high-dose garlic concentrates appears to be a feasible therapeutic regimen to consider for HIV+ patients with CD4 counts less than 100. Additional studies to evaluate the optimal dosing and route of administration will be needed to verify the efficacy of this novel agent via a Phase ll clinical trial while efforts are under way to identify the active moiety.